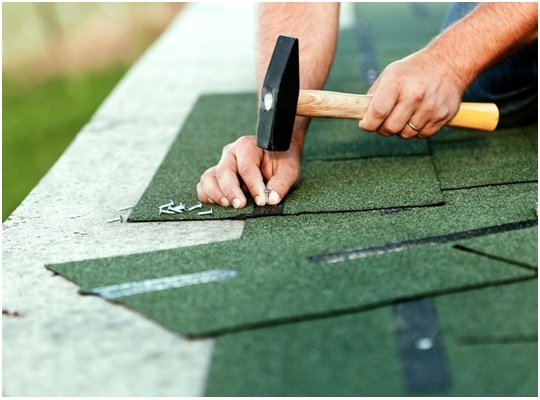 Roof installation is the first step in ensuring your home is protected from the elements for a long time. When done properly, you end up with a roof that is both beautiful and efficient. Key to this is finding great roofers—like those here at Tedrick’s Roofing. And one way to tell professionals from those who are not is by checking if they have the tools necessary to get the job done right. To help us take off the existing materials that need replacing, we use the roofing hatchet. It allows for finely targeted hacks to make sure not even the smallest bits of the old roof are left behind. An aptly named roofing tool, the shingle cutter is used to more accurately shear shingles that might not be a perfect fit—especially at the edges or corners. The nail stripper, on the other hand, contrary to its name, holds nails in place for a more secure hold on your roof. Once we have all the material in place, the caulk gun is used to seal off any and all gaps on the roof. This makes sure that there isn’t a place for water to seep in. Last, but certainly not least important, is the safety equipment that will always take center stage in any roofing project. It includes ladders, ropes, helmets, and everything else that will help keep our roofers and your house safe throughout the whole process. Naturally, tools aren’t the only things that determine a great installation. You also need to look into the know-how, prior experience, and ingenuity of the roofers doing the job—but knowing that they’re well-equipped is a very important sign that you’ve got the right people. If you want your roof installation done properly, call the roofing contractor Federal Way has trusted with all its roofing needs for years. At Tedrick’s Roofing, we make sure our work is always to your utmost satisfaction—with no room for complaints. Contact us today at (877) 212-9355 and we’ll get your roof done right.